Chilies so hot you'll be silly with snot. As an Indonesian native, my mother used to bore regale me with stories of her college days, and boy oh boy was it different than university today in the US. One time—her proudest tale—she and two friends tested how many spicy chili peppers (bird’s eye chili and white peppers) they could stomach. Turns out, 169 among the three of them in one sitting! However, I’m not sure how well she’d fare if she had to down any of the world’s hottest peppers from this list. Taken by A. Bali via unsplash.com. [Public Domain]. So, what is the hottest pepper in the world? Spoiler: the Ghost Pepper is tame compared to these. Read on to see the current top ten measured in Scoville Heat Units, followed by an explanation on SHU scoring. At 3,180,000 SHUs, Pepper X is the hottest pepper in the world. It is yet to be confirmed by the Guinness World Records, but it took 10 years of careful crossbreeding with other hotties to get to this hell-on-your-tongue heat. Ed Currie, creator of the Carolina Reaper from the 2013 hottest pepper award in Guinness, created this one also. Mike Smith from St. Asaph, Denbighshire, created this monster, at almost 2.5 million SHUs. The Dragon’s Breath, though, remains unconfirmed for official entry in Guinness. Originally codenamed as “HP22B,” is the official hottest pepper in the world, holding the Guinness World Record since 2013. At an average 1.4 million SHUs, the Komodo Dragon is blisteringly hot. The Guardian says the Komodo Dragon is the UK’s hottest ever commercially grown chili pepper, and you can even find them in many Tesco stores, when in season. Created by Wahid Ogeer of Trinidad, this one is said to have a tender, fruit-like flavor, if you can get past the heat. The Trinidad Moruga Scorpion had the highest mean heat in a study done by New Mexico State University in 2012, with more than 1.2 million Scoville Heat Units. The Trinidad Scorpion Chocolate is actually a “sub-variety” of the Moruga version. It’s said to be mellower and sweeter, but don’t you dare let your guard down! Be prepared to douse out the flames with a gallon of milk when trying the 7 Pot Douglah. The “seven pot” part of its name comes from the Trinidadian saying that just one of these peppers is enough to spice up seven pots’ worth of food. Also known as the Indian pepper, chiltepe, and chile tepin, the chiltepin is exceptionally hot. It is also known as the official native pepper of Texas. The Dorset Naga is a more-intense substrain of the bhut jolokia , also known as ghost pepper, grown in the UK. Elsewhere, this strain is called Naga Morich. Winner of the Guinness World Records for hottest chili pepper in 2011, the Trinidad Scorpion remains no joke. The “scorpion” name comes from the pepper being curved and resembling the stinger on a scorpion, though it really looks more like a human intestinal tract. Are Chili Peppers Fruits or Vegetables? Chili peppers are actually fruits, not vegetables, as is commonly believed. They are the fruit of plants from the genus Capsicum of the nightshade family, and you can just look at their seeds for proof. When you describe something as pungent, you probably are referring to an item that puckers up your face in disgust due to its intense odor or flavor, such as Limburger cheese or durian fruit. 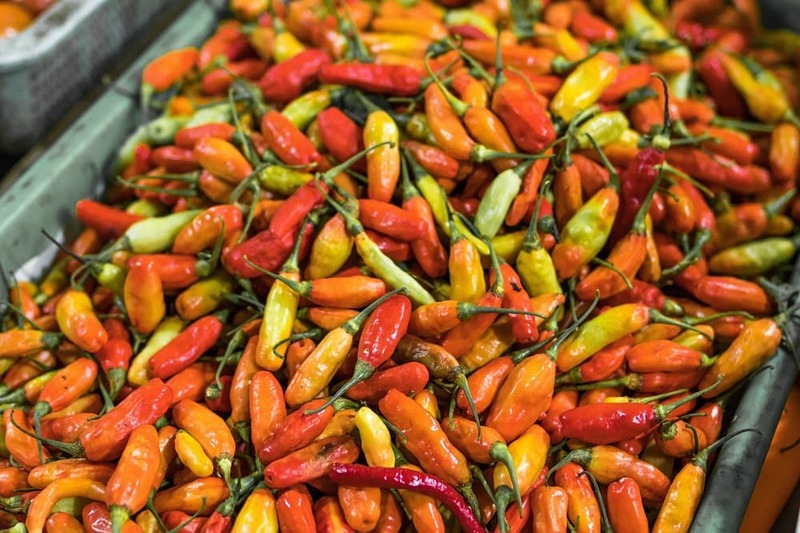 Scientists use the term pungency to refer to those characteristics of the world’s hottest peppers: spiciness, hotness, and heat. Both hot and spicy can easily get confused, one for temperature and the other representing a heavy amount of spices being used. Thus, pungency and piquancy are the technical terms given to represent the heat factor and agreeableness, respectively, in peppers and other food items. There are differing theories about the origin chili peppers, but almost everyone agrees that it originated in South America, probably around the Amazon where Bolivia, Peru, and Brazil meet. The Scoville scale is a measure of the pungency of foods, most commonly the chili pepper. It’s named after pharmacist Wilbur Scoville, who had a method known as the Scoville organoleptic test back in 1912. Today, high-performance liquid chromatography (HPLC) is used to determine the capsaicinoid content for pungency. Some of the most potent, police-grade pepper sprays clock in at 5.5 million SHU. However, this isn’t an accurate indicator of a pepper spray’s strength. Instead, the EPA & US Government use Major Capsaicinoids (MC), which is a measure of the percentage of capsaicinoids based on the contents of the entire pepper spray canister.